Vicki Young (26, June 1925 – 5,January 2007) was an American R&B, rock 'n roll and pop singer and songwriter. Vicki Young was born Wanda Cleo Stegall on June 26, 1925, in Vinson, Oklahoma, the first of four talented children born to Loda and Mintie Stegall. Descended from an early American family dating back to 1736, the Stegall family had a long history of birthing "Methodist preachers or musicians." In Vicki's case, her parents were musicians and had one of the first professionally performing family western style bands, "The Stegalls." By the time she was four, little Wanda was singing and already playing the banjo, ukulele and drums. For seven years, the youngster and her family band could be heard live over station KASA (AM 1210) in Elk City, Oklahoma. In 1942, the Stegall Family moved to San Bernardino, California, where the band reorganized. Vicki decided to head out on her own in 1948. 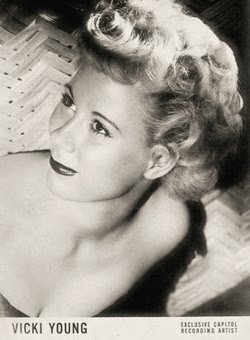 She joined the Joe Newman Trio, appeared in Los Angeles clubs and for a brief period was featured on Spade Cooley’s T.V. show. Young was discovered at The Flamingo in San Bernardino, and in 1953, at age 28, was signed was signed as an R&B artist by Capitol Records. 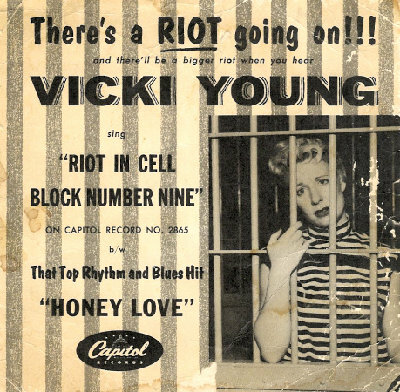 During her eight year career at Capitol Records, Young cut 56 sides, including such titles as "Honey Love," "Pink Shampoo," "Tweedle Dee," "Ricochet" and "Riot in Cell Block No. 9." 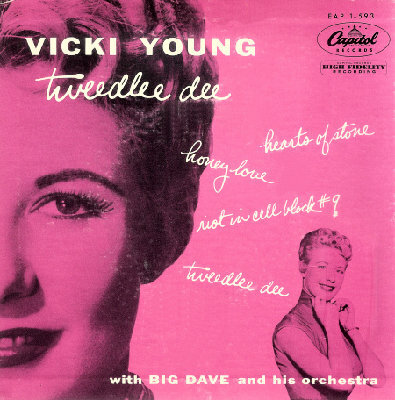 Vicki Young made the best-selling pop charts twice, with "I Love You So Much" (b/w "Let Me Hear You Say It," Capitol 2478) which charted in June 1953, and her cover of The Drifters' R&B tune "Honey Love" (b/w a cover of The Robins' R&B tune "Riot In Cell Block No. 9," Capitol 2865) in October 1954. 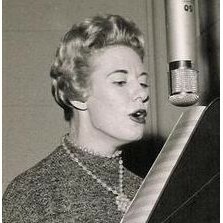 After Capitol, Vicki was one of the first artists under the Brunswick label in the mid 50’s, along with the Lennon Sisters; her first release for Brunswick was "The Cheer Leader Flip" and "Pen and Paper Sweetheart." 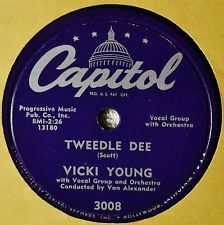 Vicki Young also wrote songs, and "Let There Be You," penned with arranger/band leader Dave Cavanaugh, remained one of her personal favourites, written just two weeks after the tragic death of her first son, Gary Phillip Truckee (age 6) to polio. The heart wrenching lyrics were based on the first verse of the Bible and the song went on to be covered by The Five Keys (Capitol 3660) and remains in circulation today. Young was married four times, her second husband being world renowned drummer and "Rock and Roll Hall of Famer" Hal Blaine. Vicki had three sons, two by her first husband and one by her third. Tragically, she lost a second son, Terrence Allen Sheehan, at Christmas time when he was struck by a car. Consumed by grief, Ms. Young left the music business in the late 50’s although she retained her love of music. During her career, Young toured extensively, performed regularly for the military and was well known for her tireless enthusiasm, vivacious personality and was regarded as one of the finest entertainers of her time. She and her family leave a tremendous musical legacy behind, which continues with her niece, singer/songwriter Casey (Stegall) Stark, of Laguna Niguel, California, and distant cousin, award-winning producer/singer-songwriter Keith Stegall, of Nashville, Tennessee. N.B. There is very scant information regarding Vicki Young, who remains virtually unknown to most music lovers. Hopefully my little blog post will highlight this under-rated singer who hasn’t even got a mention in Wikipedia!. 14 It Makes No Difference Now. 16 Bye Bye For Just A While. Here’s a gem! The only compilation album (that I know) of Vicki Young. As I gleaned these mp3’s from various sources (mainly YouTube) they will vary in quality, as some are taken from vinyl sources. I did it once before with my own Kaye Sisters compilation, when not much later, Jasmine issued a CD with nearly the same track-listing as mine. So let’s hope a Jasmine scout is on the lookout! This looks like it might be good. She's unknown to me as well. Thanks.